What if Medway Council had Proportional Representation? The following piece makes the assumption that voting intention for Medway’s local elections in 2015 would have been the same under PR as FPTP. Whilst I’m open to the idea that this wouldn’t be the case (it almost certainly wouldn’t be -Jennings), this is the data I have to work with. If you are unable to make the leap this requires, stop reading, as you are unlikely to engage with the result. If however, you read on, then I look forward to hearing your thoughts. Results data taken from www.medwayelects.co.uk, with thanks to Alan Collins. Whilst this dramatically reduces the Conservative majority, in favour of UKIP, they would have a councillor in every ward. The majority of wards would have a mixed party of councillors representing them. The council would also benefit from having Green and Liberal Democrat voices represented. I don’t want to cast aspersions with regard to the benefits of certain individuals who would not currently be councillors. I would like to say there was some potentially good individuals who are not currently councillors, who in this mix, would have been. With a result that would reduce the main parties this much and increase the UKIP, Liberal Democrats and Greens result, you can understand why there is such an establishment reaction against PR. But we can say it’s because of the maths. Also any result that could lead to TUSC winning a seat, despite having a Zero Vote Ward in Rainham North, is clearly flawed and the system should stay the representative FPTP..
Kelly Tolhurst asked a meaningless question about Syria, and asked about job losses at the Chatham HMRC site, while Rehman Chishti banged on yet again about what to call Islamic State. Meanwhile, Tracey Crouch ended up answering a lot of questions about the Big Lottery Fund. An Ofsted report into Children’s Services in Medway has ranked them as ‘requires improvement’. Medway Council post an article on this with the title ‘Ofsted report confirms Medway’s children’s services are improving‘. Impressive chutzpah. There’s an apparent “jobs boost” for Medway as Rochester Airport has been granted Enterprise Zone status. At least it kind of has. Along with half the other places in Kent. Some FOI digging has revealed that Medway Council has raised almost £1 million in traffic fines since 2013, a number all the more staggering given they only have 5 active cameras. Missing, because why do they need to actively do anything given the state of the Labour Party? The party responded to the Autumn Statement. You’ll be shocked to discover they weren’t happy about it. They’re also a bit grumpy about the Ofsted thing. The Medway Labour away team also took a trip up to sunny Oldham this week to campaign for this coming week’s by-election. Not specifically Medway related, but UKIP have now selected a candidate for next year’s Police & Crime Commissioner elections. The party held their AGM this week, and apparently had a record turn out. They even needed extra chairs and plates. Bless. The Green took the bold step of coming out in support of Chatham’s new distillery, and made a pretty good joke about a new council office that would make it even harder for the public to ask questions. Medway TUSC reemerged this week to get a bit annoyed that they weren’t invited to a Young Person’s Question Time. As you do. The campaign for a Rochester Town Council held their ‘Making It Happen’ meeting this week. Jennings went along and live tweeted it, and left believing that it’s now more likely than not to happen. This week, Gillingham and Rainham MP Rehman Chishti has managed to have his photo taken with a microphone, the Ambassador of Bahrain, the High Commissioner of Pakistan, the Chairman of Senate of Pakistan, some constituents in Parliament, Big Ben on BBC News, Big Ben on ITV News, some guide dogs at Dobbies, the local Conservatives ladies lunch, Medway Clinical Commissioning Group, the Managing Director of Southeastern, several pensioners advising him on how to bomb Syria, the Hempstead Christmas tree lighting, and some Gurdwara celebrations. He seems to take more pictures of himself every week. The Week in Medway Politics: Candidates, housing, and buffets. Out of the 7 votes in Parliament this week, Rehman Chishti voted in 4 of them, Tracey Crouch in 5 of them, and Kelly Tolhurst in 5 of them. Kelly Tolhurst asked a meaningless question about policing, and Rehman Chishti banged on about calling Islamic State ‘Daesh’ again. Tracey Crouch, in her role as Parliamentary Under-Secretary for Culture, Media, and Sport answered lots of questions about betting and gave some fantastic statistics about how many people visit the seaside. This week, the council sent trading standards officers to visit 8 vaping shops around Medway, and found 7 of them sold items they shouldn’t to children. They’ll be sorting this out by sending them each a sternly worded letter. Medway Council agreed planning permission for 131 new houses near Chattenden, despite the usual NIMBY opposition. Given Medway needs to build tens of thousands of houses in the coming years, expect lots more of these battles in the future. The Conservatives have selected Matthew Scott as their candidate for Kent Police & Crime Commissioner. His experience of policing seems to consist of the fact his family have been police officers. After weeks of mysteriously talking about policing issues and holding various policing related meetings, Luton and Wayfield Councillor Tristan Osborne announced he was indeed running to be the Labour candidate for Kent Police & Crime Commissioner. He at least has experience of being a Special Constable, which makes him marginally more qualified than Matthew Scott. Still missing, presumably still not entirely sure what they should be doing. This week Medway Lib Dem anger is focussed on cuts to policing. If you fancy a party and a half, members are invited to their AGM at the swanky Roffen Club on Thursday, where there will be (brace yourself) both a buffet and a social. Phew! The Greens seem to be the only Medway party taking a position on a potential lower Thames Crossing. Of course, they’re opposed. Still missing, presumably still hunting for their missing votes. The campaign to create a Town Council for Rochester rolls on. The petition signatures have been collected and handed in, so what’s next? The organisers are holding an open meeting tomorrow (Monday) night for anyone wanting to find out more, suggest ideas, or get involved with the campaign. This week, Gillingham and Rainham MP Rehman Chishti has managed to have his photo taken with someone from the Howard School, a microphone, the Daily Politics green screen, some rather baffling framed photos, some folks at a charity reception, some quality desks, a bunch of young Tories, someone from the Foreign & Commonwealth Office, a present as big as himself, and new Police & Crime Commissioner candidate Matthew Scott. Crikey. Parliament was in recess this week, so our MPs haven’t been up to much there, but that didn’t stop Tracey Crouch getting herself into trouble (see below). Medway Council has begun the ‘largest council-built bungalow development’ in the UK. The ‘largest’ being a grand total of 32 dwellings. Which is nice and all, but Medway has thousands on it’s housing waiting lists. Medway Council will soon beginning drawing up a new local plan, identifying development sites for the coming years. Which will definitely go well. The Conservatives have announced their shortlist for their candidate to be Kent Police and Crime Commissioner next year. None of the names on the list are particularly relevant to Medway. The party have taken the opportunity to crow that changes to Sunday trading rules have been delayed. Despite the fact Scotland has more relaxed Sunday trading, the SNP have decided to block such moves for the rest of us. Ain’t democracy grand? Missing, presumably not entirely sure what they should be doing. The Greens have called for a Medway cabinet portfolio holder to be dedicated to rural areas, wildlife, biodiversity, and all that kind of stuff. Apparently they’ve also been canvassing in Rochester. Has anyone actually spotted ’em? Chatham and Aylesford MP Tracey Crouch gave a fairly wide ranging and interesting interview to the Spectator, and in one fairly throwaway section, suggesting that certain constituents who are struggling financially should perhaps give up things like Sky TV. Cue the usual outrage machine going into overdrive, followed by the inevitable apology. This week, Gillingham and Rainham MP Rehman Chishti has managed to have his photo taken with constituents Colin and Carol, the High Commissioner of Brunei, radiographers from Kent Oncology Centre, a distillery with Kelly Tolhurst, stuffed toys at the Women’s Institute, a church Santa, some men at a football match, and folks at the Medway Hindu Temple. Even on his week off, Rehman doesn’t fail to get around. A fairly quiet week, but this is whats been happening in Medway politics in the last seven days.. Nothing much happened from a Medway perspective in Parliament this week. Tracey Crouch answered some questions, Kelly Tolhurst brought up immigration, and all three MPs voted in every vote they were able to. Seemingly the only thing Medway Council has been focusing on this week is blowing up a bit of the sky on Saturday. They did it pretty well though. Missing, presumed hibernating until April 2019. Medway Labour want some payday lenders hung, drawn, and quartered. They also decided Remembrance Sunday would be a good time to make a political point about police cuts. Former Medway UKIP candidate created a Twitter account just to tell us Medway UKIP are still active, but we still haven’t seen much proof of that. This week they’re outraged about roaming charges and Right to Buy. 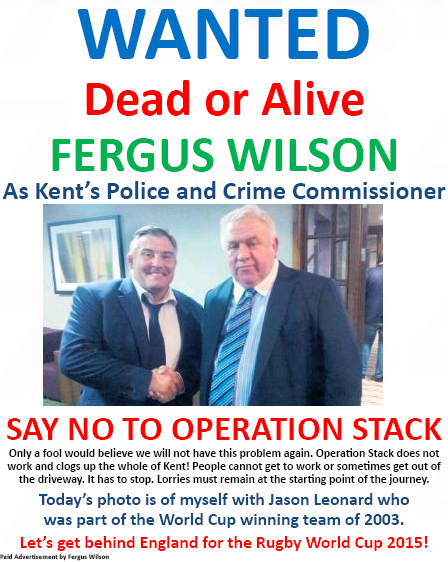 They also confirmed that they will fight the 2016 Kent Police and Crime Commissioner election, after not bothering in 2012. After moaning at us last week for not checking their Facebook page, we’ve now learnt they’re unhappy about development in the Capstone Valley, and excited about a beer festival. Fair enough. This week, Gillingham and Rainham MP Rehman Chishti has managed to have his photo taken with Admiral Lord West, the team at St. Matthews Church, Lib Dem MP Norman Lamb, Speaker John Bercow, staff and pupils at The Howard School, staff at Medway NHS Trust, the CEO of MHS Homes, a solitary constituent in Rainham, and Santa. Say what you want about Rehman, the man gets around. I can appreciate the frustration of running a political blog and only getting a limited response from members, I really can. I would also note that any resident committing time to blogging about local government should be commended. Not least the commitment to still be at full council going into the 5th day of Local Democracy week! However, it is disingenuous to infer that because members haven’t responded to an overtly political blog that they are not responding to constituents. I am sure that my colleagues from across the chamber won’t mind me saying that the great majority of ward work is apolitical and that as a ward councillor you don’t assess a case for its political volatility or opportunity to score points. Having just given evidence to the Independent Remuneration Panel, when their report comes out, I understand it will have an analysis of the time commitments made by ward councillors. I hope that this will be a more concrete form of evidence than a round robin email. When it comes out, I would be happy to bring the report to your attention, if this would be of help. We appreciate the fact that Cllr Mackness has taken time to respond to us on this issue, but unfortunately, we also feel we must take issue with some points he raises. We accept that a “round robin” email isn’t a good way to assess how well councillors are doing their jobs, nor was it necessarily supposed to prove that one way or the other. The intent behind our experiment was to simply see how likely one was to get a response, as email has often been cited as an alternative option given the removal of questions in the chamber. The problem here is the removal of the public record. Of course this kind of email isn’t an ideal way to see how well a councillor does their job, and nor should it be, but when the on the record options in the chamber was severely restricted, exactly how else are we supposed to judge how responsive a councillor is? We know a good number of councillors from all parties go considerably above and beyond their duties, just as we know there are some that don’t. The issue is that as each aspect of public scrutiny is removed, it becomes increasingly difficult for the average member of the public to gauge how much their councillor is doing. It’s also disappointing that we’re being painted as an “overtly political blog”, though we’re not entirely sure how to be a covertly political blog. We have stances, but we have gone to great lengths to engage and give a platform to parties and politicians of all stripes. Even if Cllr Mackness feels we don’t deserve to be regarded as press when it comes to politics in Medway, it’s unfortunate that we weren’t seen as deserving as answers as residents either. We’ll be very happy to look at (and cover) the findings of the Independent Renumeration Panel on how much councillors are doing, in the same way we’re happy to look at anything that gives us a glimpse into how councillors are or are not performing. Until then though, we’ll go on the evidence we’ve managed to collect so far. Unless something changes in the coming months, this will likely be the last gasp of the public questions issue for now. Just time for a quick round-up of the week’s events in Medway politics..
All three Medway MPs voted to maintain sanitary products as “non-essential luxury items”. All three have since defended their vote, arguing it’s not as clear cut as it appears, and you can read their responses here: Rehman Chishti, Tracey Crouch, Kelly Tolhurst. Rehman Chishti introduced a brief debate in the Commons on the nature of the UK’s support for Pakistan, which you can read in full here. A parish by-election this week in Cuxton, where a straight two-way battle was fought between independent candidate Tracy Thorley and Conservative candidate (and former Mayor of Medway) Josie Iles. In the end, it wasn’t even remotely a close run contest, with Thorley defeating Iles with 434 votes to 90. Medway Council is seeking volunteers to clear snow because they can’t manage it themselves. All quiet – there’s no elections on for another four years now. This week they have they threatened to hold the Conservative cabinet to account. Somehow. They’ve written to Sajid Javid to demand it remains impossible to get a pint of milk or a prescription on a Sunday evening. They apparently support the council’s Cycling Action Plan. The council has a Cycling Action Plan? Former parliamentary candidate Tristan Osborne is very unhappy about Police & Crime Commissioner Ann Barnes, which is nothing to do with the position being up for election next year. Certainly not. They’re outraged about some rubbish that wasn’t collected until they reported and then it was. Alrighty then. They’re also outraged about the changes to public questions, but then who isn’t? Missing, presumed defected to Labour. Missing, presumably searching for missing votes. This week, Rehman Chishti has managed to have his photo taken with scouts in Hempstead, students at MidKent College, poppy sellers in Gillingham, his own face, the team from Kings Treasure Church, more poppy sellers, and, er, Lembit Opik. Phew!